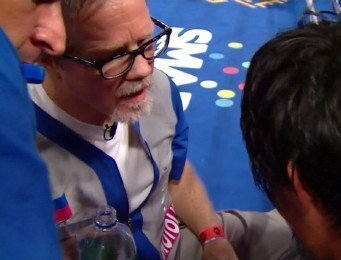 Trainer Freddie Roach believes a possible reason why the unbeaten Terence Crawford (27-0, 18 KOs) wasn’t put in with Manny Pacquiao (57-6-2, 38 KOs) for his next fight because Top Rank promoter Bob Arum might have wanted to protect the 28-year-old Crawford from being pushed into such a tough fight at an early point in his career. Instead of Pacquiao fighting Crawford, which was a fight that a fair amount of fans wanted to see, Arum selected Tim Bradley (33-1-1, 13 KOs) for a third fight against the Filipino star. Pacquiao and Bradley will now be facing each other on April 9 at the MGM Grand in Las Vegas, Nevada. It’s more likely the case of Arum wanting to protect Pacquiao than wanting to protect Crawford. At 28, Crawford should be ready to fight the major guys at this point in his career. He’s looked a little flawed in some of his fights against small guys of uneven talent, and you have to speculate that Crawford might fall apart if he’s moved up a weight division to fight a solid guy like Pacquiao. I’m not even talking about some of the power punchers in the 147lb division like Keith Thurman or Errol Spence Jr. I’m not sure that Crawford has the bone structure to fight guys that are naturally bigger than him like those fighters. Crawford might be better off staying at 140lbs his entire career. Even if Crawford does move up to 147, he’ll probably wind up like Bradley, mainly fighting Arum’s own fighters like Jessie Vargas and Brandon Rios. With the way Floyd Mayweather Jr. is burning through his $400 million fortune, I wouldn’t be surprised if he has to come back to the Manny bank for another refill. Just today, Mayweather dumped $250,000 on a gold and diamond necklace, according to TMZ.com. Spending money on diamonds that don’t resell for what you put into them is going to waste Mayweather’s fortune quickly, and it’s going to be difficult when/if he needs to liquidate those diamonds to get money. If Mayweather keeps spending his money on expensive diamonds, I see him burning through enough of his fortune to need to make a comeback in a year or so.